WTI crude prices are slightly above $46/b this morning. Friday brought a price rally after two steep price collapses last week. WTI opened at $46.35/b today, up $0.84, or 1.85%, above Friday’s opening price. Current WTI prices are $46.10/b, down $0.12 below Friday’s closing price. Last week ended nearly $3/b in the red despite Friday’s rally, though the buying spate made it possible to end the week above $46/b. Before this current session, WTI crude prices had opened lower in twelve of the last sixteen trading sessions, falling by 14.8% ($7.89/b) since April 12th. After such a major downturn, the market was technically oversold, and many analysts noted that prices had essentially hit bottom. 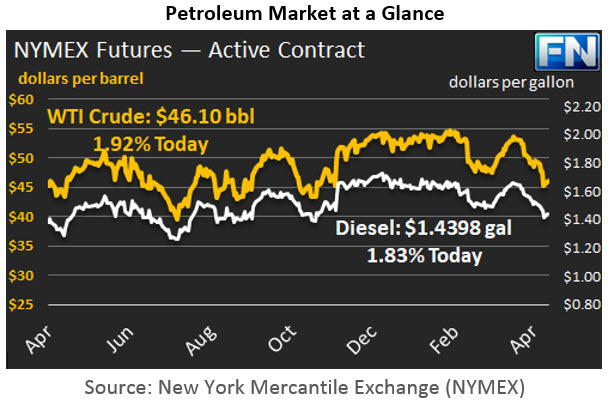 Crude prices remain at their November levels, prior to the OPEC production cut deal. Diesel opened at $1.4465/gallon in today’s trading session. This was an increase of 3.51 cents (2.49%) above Friday’s opening price. Current prices are $1.4398/gallon, up by 0.32 cents from Friday’s closing price. Until today, diesel prices had opened lower for fourteen of the last sixteen trading sessions, dropping by 24.31 cents, or 14.7%, since April 12th. 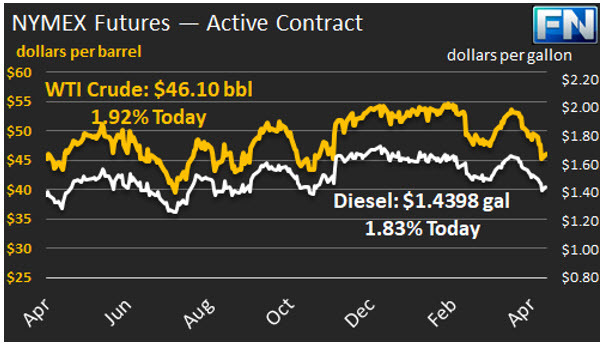 Diesel prices remain at their lowest point since mid-November, despite Friday’s rally. Gasoline opened at $1.5065/gallon today, a recovery of 2.4 cents, or 1.62%, from Friday’s opening. Prices are $1.5122/gallon currently, an increase of 0.76 cents from Friday’s close. Until this morning, gasoline prices had opened lower in fifteen of the last sixteen trading sessions, dropping by a total of 28.14 cents, or 16.0%, since April 12th. Last week, prices slumped on rising concerns of oversupply, with oil production growing in the U.S. and other regions. Libyan production rose, and it has the potential to grow even more solidly and remain stable if the two rival governments reach a lasting accord. The OPEC-NOPEC compliance rate also was revised downward for April. Looking back to November 30, 2016, WTI opened at $45.24/b. When OPEC announced that it had successfully inked a deal, prices shot above $51/b by December 2nd. The OPEC-NOPEC production cut agreement was the key factor that bumped oil prices above $50/b at the beginning of December 2016, and the high compliance rates achieved supported prices through the first quarter of 2017. Yet excess global inventories have not been pared away as expected because of rising production outside of OPEC. OPEC reiterated its commitment to the cuts, and Saudi Arabia also announced that Russia was ready to join the OPEC participants for an extension. This helped fuel Friday’s price rally. The U.S. Jobs Report on Friday exceeded expectations. The Bureau of Labor Statistics (BLS) announced job growth of 211,000 in April, versus expectations of 190,000 jobs. The BLS reported also that the unemployment rate fell to 4.4%, versus expectations of an increase to 4.6%. This fed economic optimism in the U.S. In Europe, markets reacted favorably to the results of the presidential election in France, where Emmanuel Macron won over Marine Le Pen.